There are very few neighborhoods that make life convenient for bachelors, couples and families. One of the thriving arteries of Sharjah, Al Shuwaiheyn area provides residents and tourists everything that you could possibly need for day to day living. Situated in the heart of Sharjah, just off the Corniche and on the north side of Burj Avenue (Bank Road), is one of our proud landmarks ‘The Arts area’. The Art area comprises five architecturally acclaimed heritage buildings and a mosque dating back to the end of the eighteenth century. 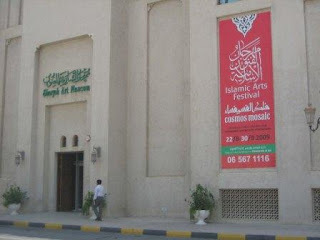 Here you will find Sharjah Art Museum, Sharjah Art Centre, Sharjah Art Galleries, Emirates Fine Arts Society and the Very Special Art Centre. There is also a café. Parking is easily available alongside the Creek (3 minutes walk) or in the basement below the Sharjah Art Museum. The Sharjah Art Centre is housed in the beautifully renovated three-storey Bait Al Sarkal that used to be the house of the British Commissioner for the coast of Oman and was later turned into the missionary hospital, where many prominent Sharjah residents were born. The Art Centre offers classes for all ages and abilities, conducted by qualified art teachers. Next door is the Art Cafe, which serves local meals, snacks and beverages. At the far end of the area, Art Studios are housed in the Obaid Al Shamsi house, where many artists have a place to work. Close by the house of Abdulla Al Sari has been transformed into an area where disabled persons can practice their art. On the opposite side of the square is the Sharjah Art Museum, which was opened in 1997 and is the largest art museum in the Gulf. It has a total of 32 exhibition halls, of which eight are dedicated to the private collection of the Ruler who has donated them to the museum. This collection consists of eighteenth and nineteenth century oil paintings, watercolours and lithographs as well as modern paintings of local scenes. The museum has a very active programme of rotating exhibitions, covering every field of art, both local and international. Currently showcased is ‘The Orientalist Collection’ displays the works of art in the Sharjah Art Gallery, which were personally collected by His Highness Dr. Sheikh Sultan bin Mohammed Al Qasimi, Ruler of Sharjah who takes special interest in his passion for art and culture. It is common for Sheikh Qasimi followed by tight security to make timely visits to the Museum and heritage area, especially during the winter (November – March), as most inauguration of art exhibits take place during this time of year. The architecture of the new museum building blends very well with the old buildings in the square, and the whole area with its narrow alleyways and special lighting has a very special atmosphere. 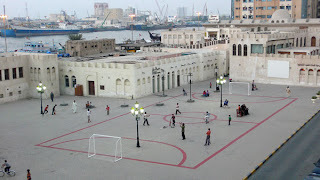 The ground is also transformed to a play area for all the neighborhood children, football and cricket are common sports as well as cycling. Adults use the ground for exercising and refreshing walks. Irani Market (Bazaar), renowned for household items, dry fruits and textiles. Another vital element of this area, is the Irani Market (Bazaar), a chain of household items, textiles, grocery and perfume shops are very hard to miss. The Irani Market is an necessary stopover during Eid, where shoppers come from far and wide to buy the delicious dry fruits. Sarah Shopping Centre, Sharjah Additionally, essential amenities like the Emirates Post office is also provided, Stationary shops, Furniture Shops, Video Libraries, Supermarkets/groceries, Furnished flats/hotels, Laundries/dry cleaning facilities, Tailoring/ Garment, prayer halls/mosques outlets as well as Medical Centers and hospitals are easily available and in variety of numbers. Al Shuwaiheyn also has its very own Shopping Centre. Sarah Mall is a four storey that has wide variety of jewellery, clothing and food outlets. When it comes to dining, Al Shuwaiheyn does not let you down, providing an array of relishing cuisines such as Afgani, Iranian, Chinese, Indian, Pakistani and Arabian, that too at reasonable rates. Al Shuwaiheyn being a commercial area, one is bound to be exposed to traffic especially on weekends, as locals and expatriates love to spend limitless amount of time browsing through the shops. Al Shuwaiheyn also endows what no other neighborhood can, the sweet smells of the biscuit factory (Tiffany) that is opposite the Irani Market welcome visitors to the neighborhood. The factory is separated from the street by a narrow part of the Arabian Sea. The Khalid Port is a mini abra that allows trading through sea to occur easily. The most scenic view is when the sun sets, you can witness the sun sinking into the ocean from your balcony allowing you relax and unwind after a hard day’s work. Early morning and late evening most adults go for walks along the coast that leads to the Sharjah Beach. Megna Kalvani. Powered by Blogger.